One of us slumps back on the seat. Another sips water slowly. I groan and clutch my stomach. We did it. 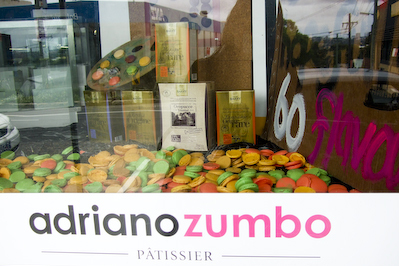 We went to Adriano Zumbo's patisserie on his special Macaron Day to celebrate his birthday, and we tried one of every flavour that was available. 48 macarons later, I felt like I had a macaron baby in my tummy. That night, I had nightmares of macarons coming to eat me - Revenge of the macarons! It truly was one of the most insane things I've done in my life. 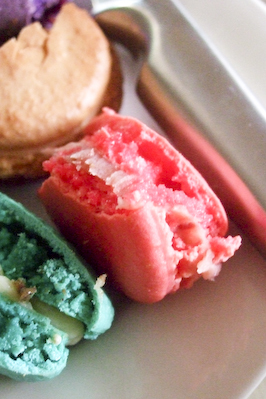 Karen, Leona, Lisa and I had been planning to attend the Macaron Day from the first moment we heard about it. Plans were made, and were whipped up into an even greater frenzy when the list of flavours that would be available was released. Makes your heart skip a beat doesn't it? It was far too hard to choose from that list so I was super pleased that we decided to get all of them. 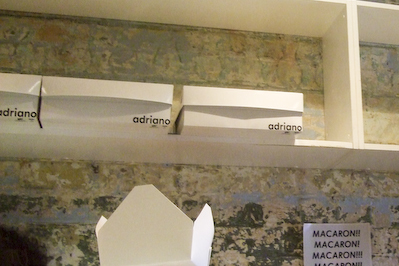 They even had specially packed boxes sitting on the shelves above ready for crazy people like us. The chupa-chup flavoured macarons immediately stood out, bright blue and standing on lollipop sticks - a last minute flavour addition which I had to get another of just because it was so cute. 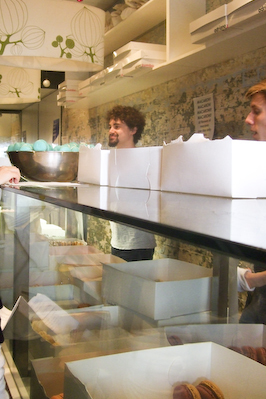 We took our treasure box of macarons down to the cafe and eagerly opened the enormous thing up. It was SOOOO PURDY! 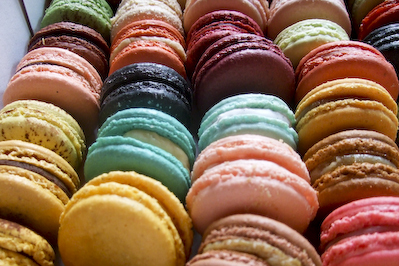 All those brightly coloured macarons, some perfectly shaped, some with crazy looking fillings and some with cool different shapes (like the tear-shaped fig and blackcurrent macaron). We ordered drinks and slowly started to taste test our way through the box, picking one at a time and each taking a small bite out of each. It was lucky for us girls that we had Karen's bf with us to help polish off the end of each macaron! 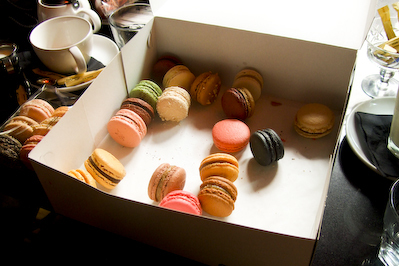 The box included 46 macarons in total, and we went back to the patisserie afterwards to try two that hadn't been placed in our box. All the macarons were said to cost $2 each except for the black truffle flavour, I'm not sure how the math worked out. The $10 black truffle macaron seemed a little steeply priced, and I think the fact that we tasted it amongst so many other macarons made its flavour less of an impact. Afterwards we returned to the shop to double check some of the flavours we had been unsure about while tasting (this didn't happen too often, most of the flavours were startling obvious as soon as you tasted them - caramello koala!) and realised we hadn't tried the neopolitan and the beer and nut flavour in our box, so those were tasted too (with some difficulty due to our macaron overdose). 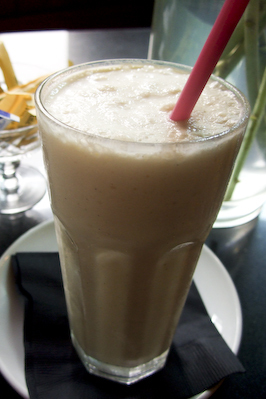 I don't know what madness gripped me when I ordered my drink, but I chose an ENORMOUS iced white chocolate and immediately realised my mistake after tasting about 5 macarons. Too much sugar! I feebly managed about 5 sips of this drink before I switched over to gulping down glasses of water. It was a really nice drink though! Isn't that just the nuttiest flavour you've ever heard of??? 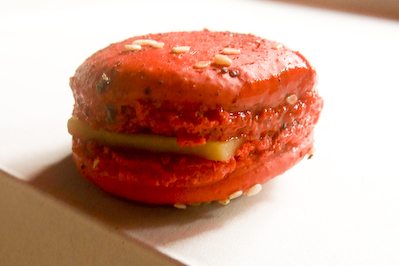 The cheeseburger macaron was a tomato sauce flavoured shell sprinkled with sesame seeds, with a tiny slice of cheese and small bits of pickles in the middle. Some people claimed that there was a hint of a meaty flavour in there but for me the most dominant taste was that of the tomato ketchup. Sweet and very sour, it was odd but intriguing, and surprisingly the flavour I remember the most out of the entire batch. 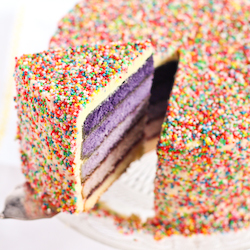 The texture was a little soft and wet for my liking, but it looked so good! Everyone could tell straight away what the flavour was meant to be, just from the look of it. Not quite sure which flavours they were, I think maybe finger bun and a chocolate one. To be honest, all the chocolate ones tasted very similar to each other, maybe some had hints of spices that the others didn't but when you've had 5 chocolate ones they pretty much all taste the same. 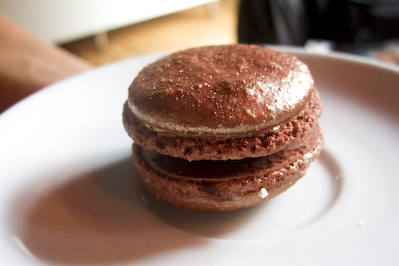 The black truffle macaron was also stunning, black shells with a white ganache and silver dust on top. 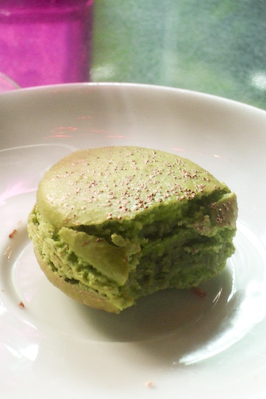 The green tea macaron was memorable because it was so so pretty, dusted with gold/bronze glitter, and it really had a good hit of matcha flavour throughout the biscuit and the ganache. I've had green tea flavoured sweets in so many places only to be disappointed by the lack of punch in the matcha flavouring, but this one did not disappoint. Another that was bold and quite a curious pairing of flavours was the blueberry and goats cheese. The cheese flavour was incredibly subtle, only really apparently in a lingering aftertaste, but the blueberry was lovely, especially the bit in the centre. 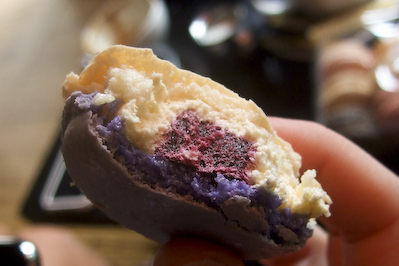 It made for a really pretty macaron too, with the white and purple shell (okay I might be a bit biased due to my love of all things purple). The rosemary and olive oil was another memorable one for me. I hadn't expected the rosemary to work in a sweet, but it was not too strong and very surprising indeed. Not everyone was a fan of this one, but I was thoroughly enjoying the unique range of flavours that were being presented to us, and it really had my mind running along with all the new possibilities for macaron flavours that I could try at home. By this point some of us were starting to feel the effects of all that sugar. But Karen pressed us on, telling us we were almost there! The waitstaff and other people in the cafe very obviously thought we were stark-raving mad to try and eat the entire box in one sitting. Everyone knows I'm 50% nanna and 50% hyperactive child. The chupa chup flavour and the strawberry bubblegum flavour totally spoke to my inner child, revelling in those sugary artificial flavours. It really tasted like strawberry bubblegum! And the chupachup flavour had popping candy in it! Too awesome. While others may not have been super wowwed by these, I had a lot of fun with them. 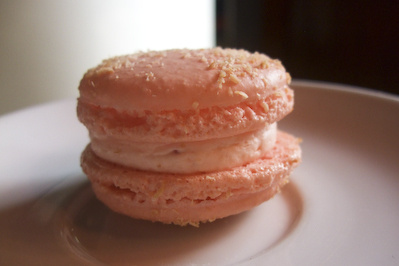 Along with the two above, I also bought an extra of the lamington flavoured macarons. Unfortunately I bought the extra ones before I tasted all the flavours, so I ended up with some flavours that I wasn't too crazy about. But I was so pleased with the lamington flavour, it tasted just like how I imagined it would and was a favourite of the ones I took home. I also took home an avocado, pancake with maple syrup and bacon, burnt toast and butter and a fig and blackcurrant one (I had to, it was purple!). The pancake, maple syrup and bacon one disappointed me a little, it just tasted really sweet and I think I was expecting it to have more bacon in it or something. The avocado flavour tasted a little too strongly of unripened avocado, not quite like the creamy avocado/sweetened condensed milk flavour that I've had when I've had avocado as a sweet before. The burnt toast and butter tasted EXACTLY as it's described, it was crazy. 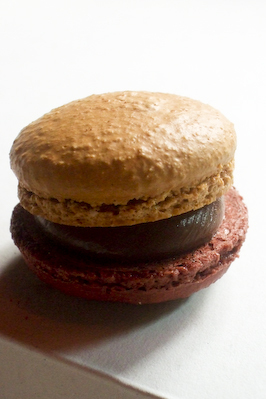 The moment I saw the salted caramel and chocolate macaron I knew it would pack a punch. Intensely rich dark chocolate and very salty caramel indeed, it was indulgent and I don't think I could have eaten a whole one even if I was having it on its own, rather than with 40 others. The ganache was gorgeously thick and smooth. 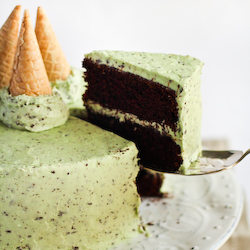 Surprisingly, the chocolate and mint was the huge hit as we approached the end of the box. 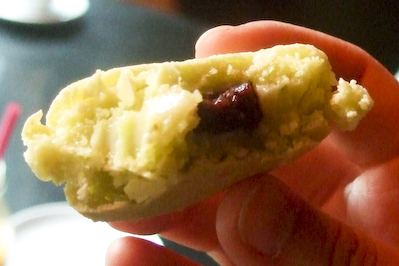 Most of us were looking as green as the colour of the biscuit by this point, but all of us loved the lightly refreshing taste of the fresh mint in the macaron, which made it much better than if it had just been made with peppermint essence. The chocolate and raspberry was definitely one of my favourites of the chocolate combinations. All the chocolate and fruit flavours were intense and really lovely, Karen was in raptures about the citrus and chocolate flavour and I had loved the orange and date macaron. The raspberry was probably one of the less strong flavours, to the point where some mistook it for the turkish delight flavour, until we tasted the real turkish delight flavour which was a very light rose flavoured macaron with no chocolate (I love turkish delight, so this one made me smile). We all decided at the time that no matter what flavour it was, it was really good! 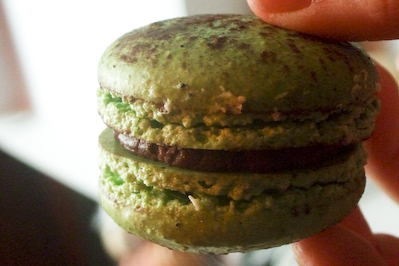 All of us wished that we had ended the box on the chocolate and mint flavoured macaron, since it was almost palate cleansing - like an after dinner mint. Instead we ended with three of the heaviest, strongest flavours (probably because kept putting these ones off! 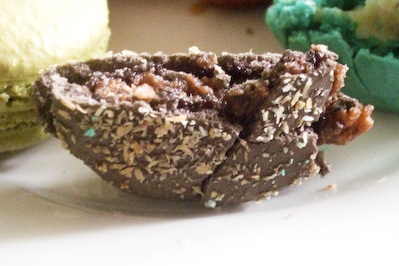 ); peanut butter, licorice and blue cheese and pear. I couldn't eat the peanut butter flavour, but the licorice flavour wasn't too bad (I'm only a recent fan of licorice), and the blue cheese and pear flavour had that very distinct blue cheese aftertaste. And with that final, desperate push to taste those final macarons, we had done it. 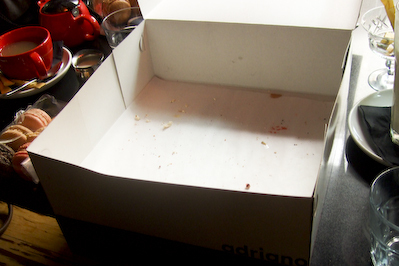 In less than an hour and a half, the entire box was gone. Our bites of each one had gotten smaller and smaller as time went on, til we were having squirrel-nibble-sized bites at the end. And so with a a sigh and possibly a small belch, we completed what we had set out to do. It was a little bit epic. I probably wouldn't do it again, but I'm so glad I did do it so at least I can't regret missing out on any of the really good flavours. 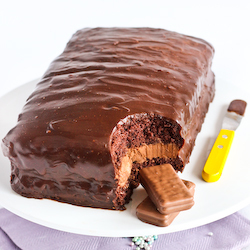 Happy Birthday to Adriano Zumbo, only he could come up with something as unique and zany as this for a celebration! It was a pretty good early birthday present for myself, It's great how many November babies there are! 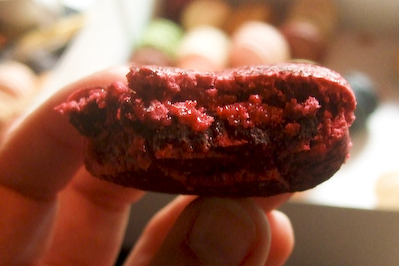 It might be a while before I can eat another macaron. I can't believe how many of them you guys had! 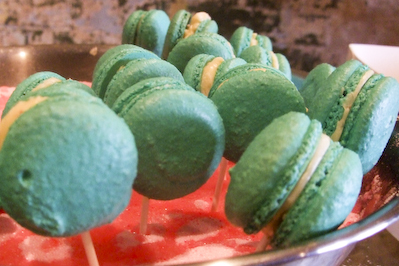 Happy early birthday and hats off to your madcap macaron escapade. 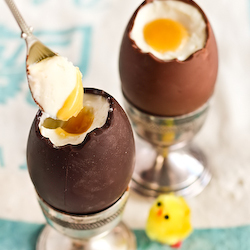 I wonder what Zumbo does with all the egg yolks? Aah my fellow sugar baby, you failed to mention about your post-sugar jitters and how you were frantically tapping your foot while you were on your macaron high LOL LOL. This just proved we'd go to great lengths for joys of food. - We are really insane. lol how could you leave out the signature jittery dance lol - had lots of fun that day totally worth it! You guys deserve a round of applause. Nay, a standing ovation. Amazing effort! That's FANTASTIC and i tip my hat to you! I'm particularly intrigued by Salted Caramel, the very notion of that flavour makes me salivate. What a grand review!!! Beautiful pictures as well! You girls really did very well! I am having a virtual macarons overdosed! I have just given you an award, please come over to my blog to pick it up. 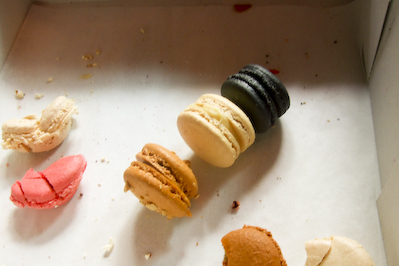 I gave it to you because anyone who can finish 48 macarons deserves an award and because I think you are doing a great job with your blog - you come up with really cool ideas like the cupcake cone! I am totally and utterly jealous!!! Oh my. 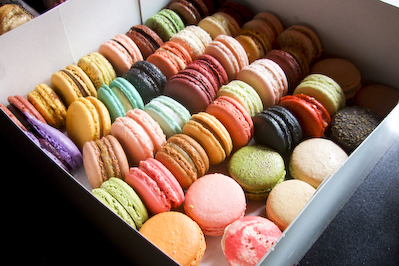 I am so impressed by your effort to consume all those macarons. I was so jealous that I couldn't attend myself, but really couldn't afford the $$ to fly from Brisbane - though I did think about it. What a great round up of the flavours, too! oh my gosh, you must have been macaroned out! Th lengths you go to for research right!?! great job! shaz - Thank you :) AHahah I bet he must use it to make his awesome tarts! Karen - AHAHA oh I cant believe I forgot to mention my crazy sugar high jitters. Lisa - tell me about it, I was feeling sick while writing about them! Leona - yeah we are EXTREEEMEE!!! LOL I know - oops. Was definitely worth it and so glad you managed to come! Rae - Heehee thank you. I always love salted caramel, this one was intense! FFichiban - oh I'm sure you could eat a ridiculous amount. Way more than we did! Ellie - trust me, a virtual one is much more pleasant than a real one. My poor stomach! Jacq - haha not sure if we would do it again but you should most definitely join us if we ever do! Trissa - Awww thank you Trissa!!! You are too sweet. I promise I'll put it up on a post soon, sorry if there's a delay, I have a huge backlog! Brenda - :) Thanks! Yeah it was a real struggle, but I had to say I tried all the flavours I could! Sophie - no worries :) thank you! Julia - Haha that would have been pretty awesome if you could have flown down but it was probably not worth it when you can make such gorgeous macarons yourself! Maria - haha yes we are dedicated food bloggers! thanks! Wow, that is insane! I have had about 5 in a row and I was done! A friend pointed out this post to me after I wrote a review of a new mamcaron book. There are flavour listed I am not so sure I want to try. kudos for you sacrifice! My sister-in-law raves about this place. I'll have to go there next time I visit her.